This is a Yardang. A what? I hear you ask? 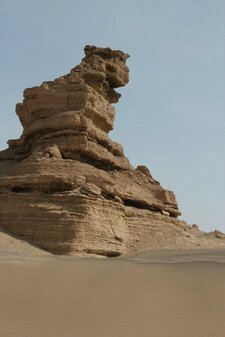 A Yardang is a desert rock formation carved from thousands of years of sand and wind erosion. They look freaky. This one is about three stories tall. I’m so glad I could share that with you, now you won’t have to take a hot, dusty trek out to your favorite desert to see one for yourself. 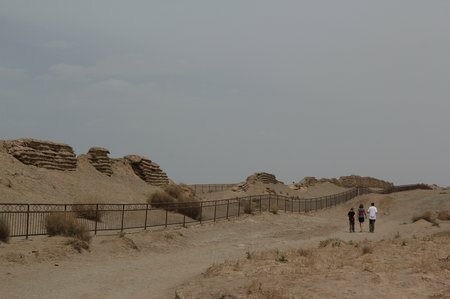 We signed up for a day-long “desert highlights” tour in Dunhuang: Yardangs, the Jade Gate pass, the Han Dynasty Great Wall (aka “the handynasty” to my kids from a sign we saw advertising it as such) and the old fortress of HeCang. 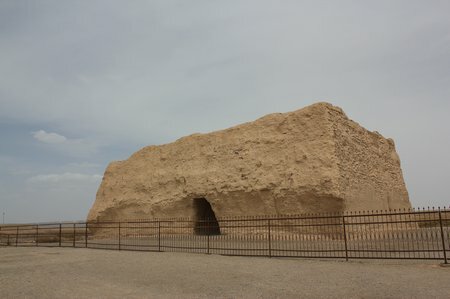 The Yardangs are in a national park area 180kms northwest of Dunhuang. In the original days of the Silk Road people would have traveled many days by camel just to get to this point. Our drive took two hot, sticky and uncomfortable hours. Were I to make the choice again, I think I’d skip the Yardangs and just go to Jade Gate – a mere 1-hour drive into the desert. which snapped my boys out of their lackluster mood. “Hey, we were there”, said CAM, pointing to Lanzhou. “And there, and there”, pointing out the stops we’d made so far in China along this ancient road. We’d talked a lot about the Silk Road before and during this trip but I think this was their “A-ha” moment. They got a kick out of tracing the route we’d traveled and seeing our planned upcoming destinations in Central Asia in the context of the overall Silk Road picture. The resulting conversation was one of those dream parenting moments. My kids rattled off what they knew about the before-during-after period in Roman History (thanks to The History of Rome podcast), citing battles and emperors and we had a good old chat about how trade and ideas moved from Europe to China and back even so long ago. Our tour was arranged by John’s Information Cafe in Dunhuang. 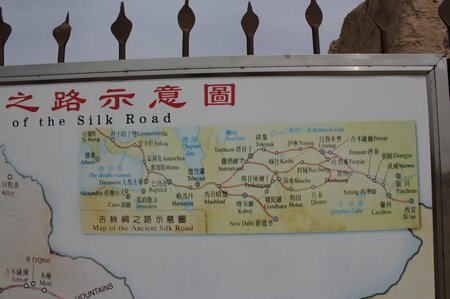 This entry was posted in China, International Escapades and tagged China, China With Kids, Dunhuang, Silk Road, Western China, Yardangs on June 7, 2011 by wandermom.